When the call for help went out on our Facebook page two weeks ago, one man in particular stepped forward to accept the mission, and he brought many others with him. 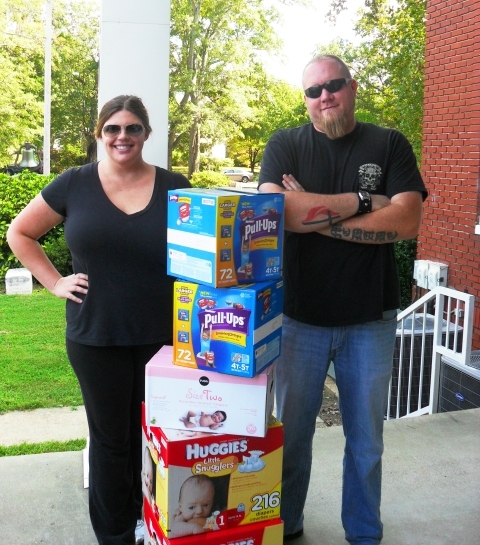 Matt McDade came to our campus last week to make a large donation of diapers and pull-ups. When Matt learned that we needed diapers and pull-ups, he went into action, collecting $5 from all of his coworkers at Ormsby’s and at American Hair Cuts in Midtown, and also collecting larger donations from the businesses themselves. Then he went to Walmart, told the manager what he was doing, and obtained a 10% discount! He bought them out of pull-ups in the size requested, so he went to Kroger to finish his shopping. And then he brought all of this to us! Matt acted as the coordinator, purchaser and driver, plus he gave of his time. Why would he do this? Matt grew up as the child of a United Methodist minister. His father was the pastor at local churches, and Matt even attended Bible study on our campus. His aunt continues to volunteer in the UMCH auxiliary each week. But the story doesn’t end there. Because Matt went back to work, and his customers continued to ask about giving to the diaper need. A few days ago, Matt showed back up at our front door with another car FULL of diapers in all sizes! We are grateful to Matt and his friends for stepping forward to accept the mission and meet a dire need with their creativity, generosity and hard work!